There is probably lots of tips and tricks how to download those. I often search for some Flash game development tutorials and sure I want to watch video again without internet connection. 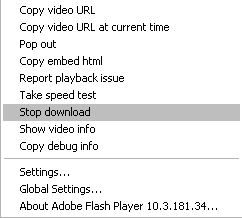 With old Flash Player plugin it was easy since all the videos was saved into browsers cache folder, but now the Flash Player holds the downloaded video in <User Name>\Local Settings\Temp (well on WinXP anyways :P) folder *.tmp files. They are locked by program and cannot be copied. I tried various force copy handlers,but not much help from those. After testing a few Firefox extensions I found the one that does the job well. It can download vidoes in High or Low quality and in .FLV or .MP4 format (yep you can watch your downloaded videos on the phone or iPod) . 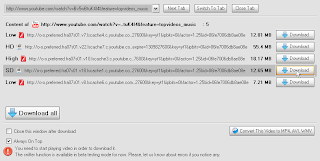 It's called Flash Video Downloader Youtube Downloader Facebook . 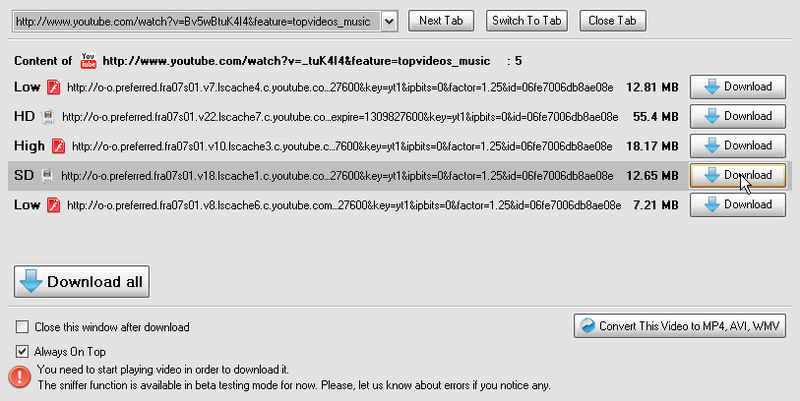 Sure it does downloads any embedded videos from any websites. To use it simply press Play on the video and right click on the player and select "Stop Download"
Find the blue arrow near address bar or in the bottom right corner and click it. A dialog should appear with all available video formats. Pick the one you need and wait until extension downloads the video.